Can I set multiple Do Not Disturb schedules on Samsung Note 8? From posts I've seen, it seemed like I would be able to do this with Do Not Disturb by setting automatic rules, but there's no option for that for me. I even see people using Nougat refer to that setting, but it's not on my phone. Does anyone know if this feature was removed, renamed, moved, or something else on Samsung Note 8/Nougat? • Turn on now: Enable this option. 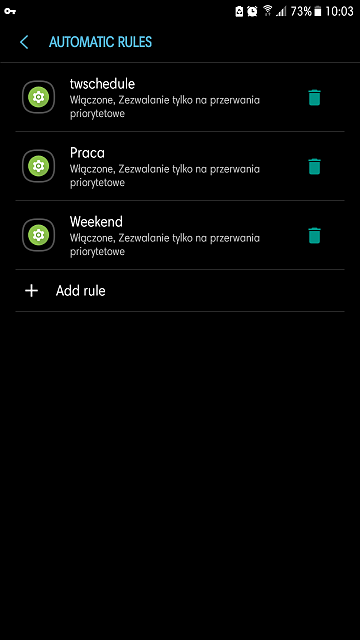 • App rules: Manage rules set by apps. I just switched from Nexus 6P to Note 8. Nexus 6P had the option which you and I are looking for, natively. I researched a bit and I believe Samsung doesn't have the Multiple Profile Scheduler option or "Do not disturb" ruler for several schedules. So we have to go with a third-party app. I got an app called "Silent Scheduler" which is doing the job perfectly for me. Its icon is a black bell. It requires no permission access which I prefer. You can double check it in your apps' permissions to make sure. Sorry for late reply but others might find this useful. 3. Run QSM and change from "incremental search" to "normal search"
5. Now you see "Settings" app click on it and choose first of two activities. Thank You Thank You! Worked like a charm and something I've wanted to be able to do for awhile! I followed your instructions domino5 and changed the icon and name but I don't know where the shortcut went. In another thread, Samsung's Sounds Assistant app was recommended for adding Do Not Disturb rules to the ONE that is present in main sound settings on my wife's Note 9. I was able to add three rules to the two that were already available in this app. I tested it out and the rule started on time and when I texted her, the phone made no sound and her Fitbit Charge 2 vibrated and showed the notification.